Since the early 1970s, thousands of white, middle-class, progressive professionals have been moved by the plight of Indigenous communities and sought out work in Indigenous affairs. Emma Kowal became one of them when she moved from Melbourne to work as a junior doctor at the Royal Darwin Hospital in 2001. A few years later, she began using anthropological methods to study this ‘tribe’ who seek to improve the lives of Indigenous people without harming them. The group she calls ‘White anti-racists’ find themselves trapped by endless ambiguities, contradictions, and double binds — a microcosm of the broader dilemmas of postcolonial societies. These dilemmas are fueled by tension between the twin desires of equality and difference: to make Indigenous people statistically the same as non-Indigenous people (to ‘close the gap’) while simultaneously maintaining their ‘cultural’ distinctiveness and avoiding the assimilationist mistakes of the past. 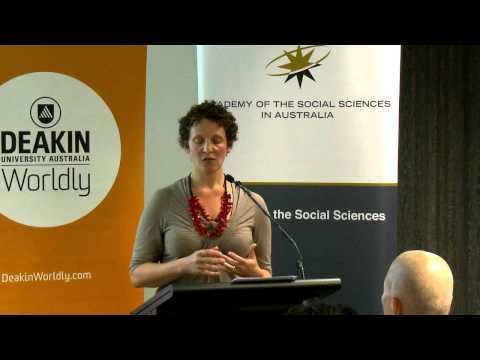 In this lecture Associate Professor Emma Kowal explains why doing good in Indigenous Australia is so hard, and how it might be done differently. Associate Professor Emma Kowal is a cultural and medical anthropologist. Drawing on her background in medicine and public health, her research contributes to the anthropology of race and indigeneity in Australia, and to science and technology studies. Awarded an NHMRC Postdoctoral Research Fellowship in 2007, and an ARC Discovery Early Career Researcher Award in 2012, she left the University of Melbourne to join Deakin University in 2014 as Associate Professor of Anthropology and Principal Research Fellow in the Alfred Deakin Research Institute for Citizenship and Globalisation. She has held visiting positions at leading institutions in the U.S., Germany, China and Brazil, and will hold a visiting professorship at Yale University in 2015. She edits the journal Postcolonial Studies and is Deputy Director of the National Centre for Indigenous Genomics at the Australian National University.